ABSTRACT: We present evidence that NASA is seriously understating Martian air pressure. Our 9-year study critiques 2,165 Sols (6+ terrestrial years, 3.23 Martian years, and a full Global Dust Storm at MSL) of highly problematic MSL Rover Environmental Monitoring Station (REMS) weather data, and offers an in depth audit of over 8,311 hourly Viking 1 and 2 weather reports. We discuss analysis of technical papers, NASA documents, and personal interviews of transducer designers. We troubleshoot pressures based on radio occultation/spectroscopy, and the previously accepted small pressure ranges that could be measured by Viking 1 and 2 (18 mbar), Pathfinder and Phoenix (12 mbar), and MSL (11.5 mbar - altered to 14 mbar in 2017). For MSL there were several pressures published from August 30 to September 5, 2012 that were from 737 mbar to 747 mbar – two orders of magnitude high – only to be retracted. We challenged many pressures and NASA revised them down, however 9 years into this audit it has come to our attention that of two pressure sensors ordered by NASA for Mars Pathfinder, one of them (Tavis Dash No. 1) could in fact measure up to 1,034 mbar. Further, for the MSL according to an Abstract to the American Geophysical Union for the Fall 2012 meeting, The Finnish Meteorological Institute (FMI) states of their MSL (and Phoenix) Vaisala transducers, “The pressure device measurement range is 0 – 1025 hPa in temperature range of -45°C – 55°C, but its calibration is optimized for the Martian pressure range of 4 – 12 hPa..” So while we originally thought that of the five landers on Mars that had meteorological suites, none of them could measure Earth-like pressures, in fact, if the higher pressure sensor Pathfinder Tavis Dash 1 (0-15 PSIA/1,034 mbar) was sent rather than Tavis Dash 2 (0-0.174 PSIA/12 mbar), three landers were actually equipped to get the job done, but the public was largely kept in the dark about it. All 19 low uv values were removed when we asked about them, although they eventually restored 12 of them. REMS always-sunny opacity reports were contradicted by Mars Reconnaissance Orbiter photos. Why REMS Team data was so wrong is a matter of speculation, but we clearly demonstrate that their weather data was regularly revised after they studied critiques in working versions of this report and on our website at http://davidaroffman.com. REMS even labelled all dust storm weather as sunny, although they did list the uv values as all low. This rendition of the Basic Report begins at MSL Sol 2129. The last weather report was for Sol 2108. There is a possibility that the dust storm will knock out the pressure sensor (assuming that it was really functioning before the storm). ABSTRACT FOR PART 2 by Barry S. Roffman (November 6, 2012 - This needs to be updated): After a cursory review of the Viking Project Data it became apparent that an extensive audit was imperative. The Viking Project Data did not seem to explain weather phenomena (spiral clouds over Arsia Mons, dust devils, etc.) clearly seen on Mars. A general discussion of the problems is offered in the Basic Report by David Roffman. The data audit results are presented in seven Annexes. The Viking Project data divides every Martian day into 25 time-bins (hours), each ~59 minutes long. Annex A (Viking 1 sols 1 to 350) and Annex B (Viking 2 sols 156 to 361) emphasize how pressures change during morning time-bins that correspond to 0630 to 0830. A simple formula, Pressure predicted = (6.51 mbar*255.77 K)/Temperature K measured, was often correct for 0730. Annex C examines how often the pressure sensor did not work (stuck or no pressures) between Viking 2 sols 639 and 799. Annex D examines the percent differences between hourly predictions and reported pressures for Viking 1 from sols 1 to 350. Annex E focuses on predictions and reported pressures for the 0.3 (0730) and .34 (0830) time-bins. Annex F maps out the best and worst prediction times each day, clearly proving the influence of the RTG heaters on hourly pressure reports. Annex G shows what went wrong in the transducer selection and testing process. These Annexes provide hard evidence that the Tavis pressure transducers used for the Vikings (and Pathfinder) likely jammed with dust during the landing process. The meaning of this is that it is doubtful that they ever measured ambient pressure conditions of Mars. There is evidence that all subsequent attempts to measure pressure were colored by the reported Viking results. Problems with Phoenix pressures based on a Vaisala transducer are discussed in the Basic Report. Annex I discusses the the initial pressure results in from the MSL with a focus on its sols 15 to 87 (Ls 158.8 to 199.8) which occurred between August 22 and November 3, 2012. PARTIAL YOUTUBE COVERAGE OF PART 1 OF MY PRESENTATION TO THE MARS SOCIETY ON AUGUST 5, 2010. Powerpoint Summary of HIGHER THAN ADVERTISED MARTIAN AIR PRESSURE. Part 1 by David. Roffman. Posted September 9, 2012. PowerPoint Summary of HIGHER THAN ADVERTISED MARTIAN AIR PRESSURE - PART 2 by Barry S. Roffman. Posted August 18 2011. 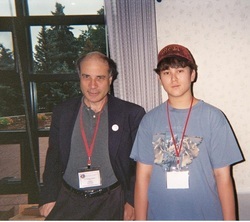 Above: David Roffman and Dr. Zubrin At the 11th International Mars Society Convention in Boulder, Colorado in 2008. 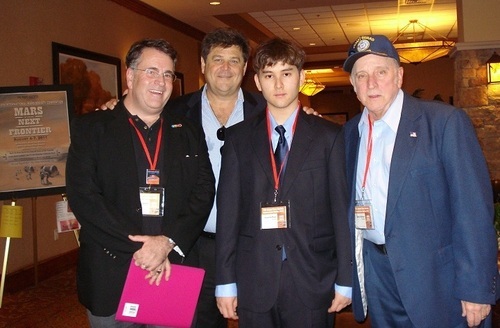 Above: David Roffman and Dr. Robert Zubrin, President of the Mars Society at the 13th International Mars Society Convention in Dayton, Ohio on August 5, 2010. Now I'm a University of Florida Gator. MSL data is as easy to consume as was Viking, Pathfinder and Phoenix data. The truth isn't just out there. It's on this web site. For a PowerPoint about how we eat MSL data, see the link below. POWERPOINT for HIGHER THAN ADVERTISED MARTIAN AIR PRESSURE, Part 3: MSL Weather Blunders and Their Implications.